I have gotten several times lately from customers wondering about the pricing on Megalodon teeth. Why is that 6 inch tooth less than the 5 1/2 inch tooth that you are selling? Shouldn’t it be more expensive? Fossils are all unique, so of course pricing is a little subjective but there are many factors that go into putting a price on a Megalodon tooth. 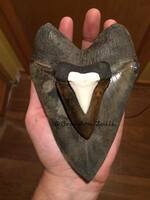 View Megalodon teeth for sale on FossilEra. All other factors being equal the larger the tooth the more it is worth. Teeth get progressively more rare as size increases, so the price also increases. Once you start to get around 4-5 inches this price increase begins to become exponential, as the larger teeth are harder find. 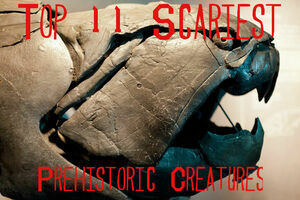 Particularly as you near the magical size of 6 inches (a very large tooth) it climbs fast. A 6 inch tooth will often sell for more than twice as much as a comparable 5 ¾ inch tooth. Good luck finding a 7 inch tooth for sale. Only a handful have EVER been found and if one did come up for sale the price would run into the tens of thousands of dollars. A note on size measurements. 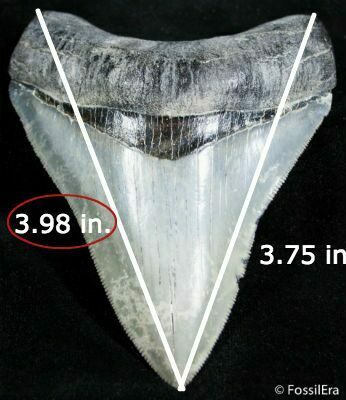 Megalodon teeth are always measured using the diagonal length from the corner of the root to the tip of the tooth. The longer of the two diagonals is the length of the tooth. I always use digital calipers to get measurements to the 1/100th of an inch as small changes in tooth size can have a big impact in price with large teeth. Just like with real estate, it’s all about location. 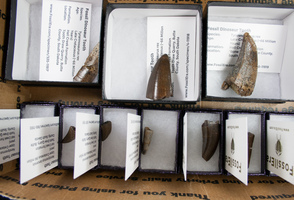 While this may not matter if you are just buying a Megalodon tooth as a present for a kid or to display on your shelf, it is very important to collectors. 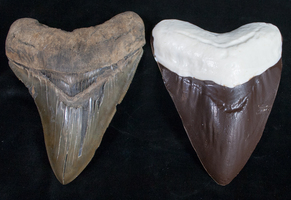 Complete Megalodon teeth are common from some locations, but very rare from others. If a site becomes inaccessible to collecting, for example the closing of the Lee Creek Mine, prices jump. In general teeth from the river and ocean deposits in the Carolinas are the least expensive while teeth from land sites such as Bakersfield are much more rare. Different sites also tend to produce unique colorations, modes of preservation and sizes. A 4 inch Megalodon teeth from the Carolinas are relatively common while a 4 inch tooth from the Bone Valley region of Florida is quite rare. The overall condition of the tooth has a big impact on pricing. A “perfect” tooth (does perfect really exist?) with no flaws is very rare, so the price will many times higher than a tooth with just a few minor flaws. Enamel – How much of it is present and what condition is it in? It’s common for larger teeth to have significant amounts of peeled enamel. Root Condition – Is it complete? It’s very common for portions of the root to be worn away. 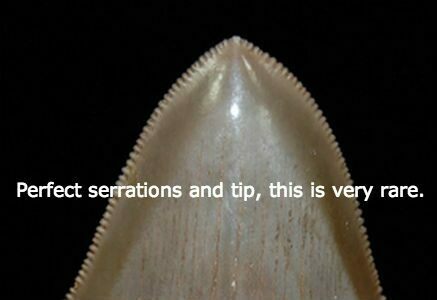 Serrations – Are they visible and complete? How sharp or worn are they? Tip – Is the tip worn? Does it have feeding damage? Teeth with a sharp tip are the exception, so it adds a lot to the price. Chipping – Are there chips out of the edge of the blade? Bourrelet – The bourrelet is a thin band of enamel between the blade and the root. 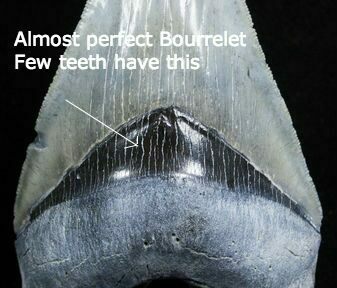 It is worn is the vast majority of teeth so having a complete or near complete bourrelet is rare. Repair refers to gluing a broken tooth back together to make it whole again. Restoration is reconstructing a missing portion of the tooth, often done with the root or portions of enamel. Both of these type and degree of these alterations affect the price of the tooth. For some minor amounts of restoration to make a tooth look better is not a big deal, while for others it is a deal breaker. 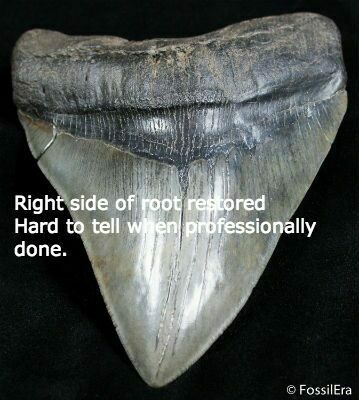 A 5 inch Megalodon tooth with part of the root restored might be ½ or 1/3 the cost of one with no restoration. Some people would rather have a tooth that looks the same at 1/3 the cost. It’s important to know what you are buying. Some of the teeth I sell have been restored or repaired but I always clearly note this in the descriptions, and the prices reflect the alterations. Unfortunately not all sellers are upfront about this, and some are simple dishonest even when asked. 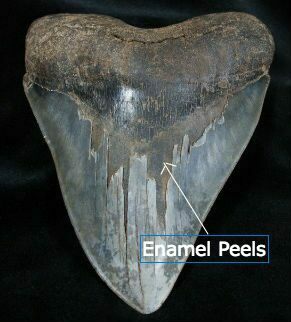 One process often used to clean Megalodon teeth is to buff it to clean the surface and this will often add a little shine to the enamel too. This is something considered acceptable by most collectors and the cleaning if done well will usually increase the value of a tooth. But, "polishing" a tooth on the other hand is where the tooth is heavily polished to the point of removing enamel in order to hide surface defects. You can take a pretty gnarly tooth and polish it to make it look semi-attractive. Because this process is in effect doing signficant damage to the tooth, the tooth would be far less valuable than an unpolished tooth. Most collectors aren't interested in polished teeth. Unique Coloration - Sometimes a tooth will have a unique coloration for the site it was found and these teeth will command premiums. Shape & Location In Mouth - The location the tooth was in the mouth of the sharp determines the shape. Lower teeth will be dagger shaped while posterior teeth will be short and wide. Some collectors prefer different shaped teeth. Weight - In addition to length overall size makes a difference. Wider, larger, heavier teeth are more valuable. Pathologies - Anything that makes a tooth unique and rarer can make it more valuable to collectors. Pathologies or deformations that happened while the shark was alive can make a tooth for valuable. There are collectors that specialize in collecting Megalodon teeth with pathologies.